Preble County, located in southwestern Ohio, is home to seven covered bridges, including Robert’s Double-Barrel Bridge. Also found in Preble County are the historic Fort St. Clair and the annual Preble County Pork Festival. Current school districts are Eaton Community, Preble County Educational Service Center, National Trail Local, Preble Shawnee Local, Tri-County North Local, Twin Valley Community Local and College Corner Local, a joint school district in Ohio and Indiana. The Preble Co. RTA was organized on June 12, 1969 with Genevieve Petry as the first President. PCRTA began with 25 members and grew to 135 members by 1996. Current membership is 189 with 75 actively attending the four annual meetings. 110 of these members are also members of ORTA. 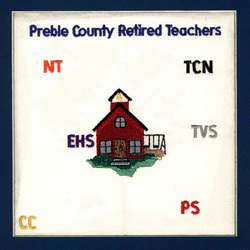 PCRTA supports the Preble County community by making contributions to a “Tools for Schools” project. The project was started by the late Barbara Bower with the purpose of providing essential school supplies to needy children. Members volunteer time in local organizations such as the Preble Co. Literacy Coalition, (founded by PRCTA member Odessa Kramer). Members also volunteer in schools, hospitals, and the Food Bank.